Debra your work is so beautiful it is really exquisite. Do you use mainly watercolour? OH, I love this....beautiful job! Gorgeous colors and composition! How do you get the soft, soft blending in the background? Your open papyas are beautiful! I just love your food paintings! Hi Debra, What a fun project! I scrolled through your blog and enjoyed looking at the sketches you've done. They're wonderful and fascinating! Your work is always stunning! I love this page, the composition, the color, all perfect! You have such a wonderful assortment of drawings. I look forward to each posting. Oh, these are wonderful! 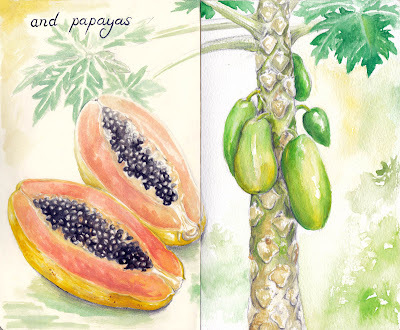 The papayas a luscious, and how interesting to see them in their native habitat. Your sketchbook will be a treasure! I truly enjoy seeing the progress of this particular journal. You are so darn talented!!! Good enough to eat Debra. Like p9 too. I just love this project. Each page is just beautiful and I can't wait to see the next post! AWESOME!!! The seeds and the trunk just blew my mind away! Wow, look at those seeds! Terrific job. wow, love your sketchbook project, beautiful work. Can't wait for the next installments!! Perfect drawing, perfect colors. You are too good.